The Lost Prayers Of Ricky Graves is an Amazon Best Book of the Month for December, a novel partly told by emails and chat-room dialogues. It's James Han Mattson's first novel — he's a graduate of the Iowa Writers' Workshop who now teaches writing at The George Washington University. Mattson was inspired in part by the case of Tyler Clementi, who committed suicide after his college roommate publicly outed his intimate encounters with another man. "I remember reading that, and just being completely repulsed by it, and having this kind of visceral reaction to it," Mattson says. "And when I have a reaction like that, I know I have to write about it." That's a good question. I've actually developed relationships online that have been as important, if not more important sometimes than my relationships in person. So I don't think it's impossible. I think it's just a different medium. I do think in times of catastrophe, especially like what's portrayed in the book, that in-person connection is so much more important than the online connection. And unfortunately in the book, Jeremy isn't there for him during those catastrophic times. I don't know if it's fully empathetic to the teenage experience. I think if you're actually a teenager going through bullying, and you're hearing this adult person telling you to kind-of just, "Wait, it gets better": First of all, I'm thinking, "You're an adult, you're an old person," and so, like, I've automatically separated you into this other completely different world that I never think I'm going to populate. And then, I also think that if you're being a bullied teenager, one of the worst things to say is "just wait," because every single day is so difficult and so torturous. And in the book, Jeremy kind of tells Ricky that he should wait, and Ricky just can't. Ricky needs to — I mean, he only has a few months left of school, but every day is very torturous for him. So he can't wait. I've thought about this a lot, and I think one of the things is: Adults really have to realize that when you're an adolescent, the most influential group is your peers. I think in adolescence there's a balkanization, whereas you have "in" groups and "out" groups. And so in order for the bullying to curb, there needs to be some overlap — the "in" group needs to, kind of, infiltrate the "out" group in a very helpful manner, OK? And that's where adults can come in — realizing who's the "in" group and who's the "out" group, and just making sure that they are interacting in a very positive manner over a period of time. And I think if we start with that foundation, we could see some results. Ian Stewart and Ed McNulty produced and edited the audio of this interview for broadcast, and Patrick Jarenwattananon adapted it for the Web. Social media platforms can connect people across the globe - and terrorize people next door. Ricky Graves is a young man just coming to terms with his sexual orientation in a small New Hampshire town. He's tormented by a jerk named Wesley - until Ricky kills him and then himself. The news media descend. And after they've gone on to the next sad crime, Ricky's pregnant sister, Alyssa, returns to the town she fled so both she and her shattered mother can try to get hold of the terrible event that's taken two lives and maybe understand the son and brother that they've loved. "The Lost Prayers of Ricky Graves" is an Amazon Best Book of the Month for December and a novel partly told by emails and chatroom dialogues. It's James Han Mattson's first novel. He's a graduate of the Iowa Writers Workshop, now teaches writing at the George Washington University. Thanks so much for being with us in the studio. JAMES HAN MATTSON: Thank you so much for having me. SIMON: There's a real-life event that set this in your mind - isn't there? MATTSON: There is. The event that spurred this book is the Tyler Clementi suicide. Tyler Clementi was a Rutgers University student who jumped off the George Washington Bridge in 2010. He did that in part because his roommate at the time livestreamed him being intimate with another man. And his roommate also invited a whole bunch of people to just watch and gawk at this spectacle. And I remember reading that and just being completely repulsed by it and having that kind of visceral reaction to it. And when I have a reaction like that, I know I have to write about it. SIMON: Tell me about Jeremy, an accountant in San Francisco, a very compelling character. He's not the accountant in Ricky's life, though. This is a man he meets in a Man-Date chatroom. MATTSON: Well, Jeremy is somewhat like me in that he was raised in North Dakota and he fled to, you know, a city to kind of, like, live his life openly. SIMON: You were raised in North Dakota and at some point understood you were gay? MATTSON: Yeah, I was raised in North Dakota. And I understood, you know, early on that I was different - probably not till later that I was gay. And yeah, I left. SIMON: And you reconstructed a lot of this - reconstruct - you don't reconstruct. You write a lot of this dialogue in the Man-Date chatroom. There are some people listening that will wonder, how can a teenager in a small town in New Hampshire and a grown man in San Francisco really get to know each other over the Internet? MATTSON: That's a good question. I've actually developed relationships online that have been, you know, as important - if not more important sometimes - than my relationships in person. So I don't think it's impossible. I think it's just a different medium. I do think in times of catastrophe, especially like what's portrayed in the book, that that in-person connection is so much more important than the online connection. And unfortunately, in the book, you know, Jeremy isn't there for him during those catastrophic times. SIMON: ...That tells young people who are gay and being bullied or demeaned, don't worry. It gets better. What are your reservations? MATTSON: I don't know if it's fully empathetic to the teenage experience. I think if you're actually a teenager going through bullying and you're hearing this adult person telling you to kind of just wait, it gets better - first of all, I'm thinking you're an adult. You're an old person. And so like, I've automatically separated you into this other completely different world that I never think I'm going to populate. And then I also think that if you're being a bullied teenager, one of the worst things to say is just wait because every single day is so difficult and so torturous. And in the book, Jeremy kind of tells Ricky that he should wait. And Ricky just can't. Ricky needs to - I mean, he only has a few months left of school. But every day is very torturous for him, so he can't wait. SIMON: You're a gifted writer. How would you - so is Dan Savage for that matter - how would you adjust that campaign? MATTSON: I've thought about this a lot. And I think one of the things is adults really have to realize that when you're an adolescent, the most influential group is your peers. I think in adolescence, there's balkanization whereas like you have in-groups and out-groups. And so in order for the bullying to curb, there needs to be some overlap. The in-group needs to kind of infiltrate the out-group in a very helpful manner. OK? And that's where adults can come in, realizing who's the in-group and who's the out-group and just making sure that they are interacting in a very positive manner over a period of time. And I think if we start with that foundation, we could see some results. 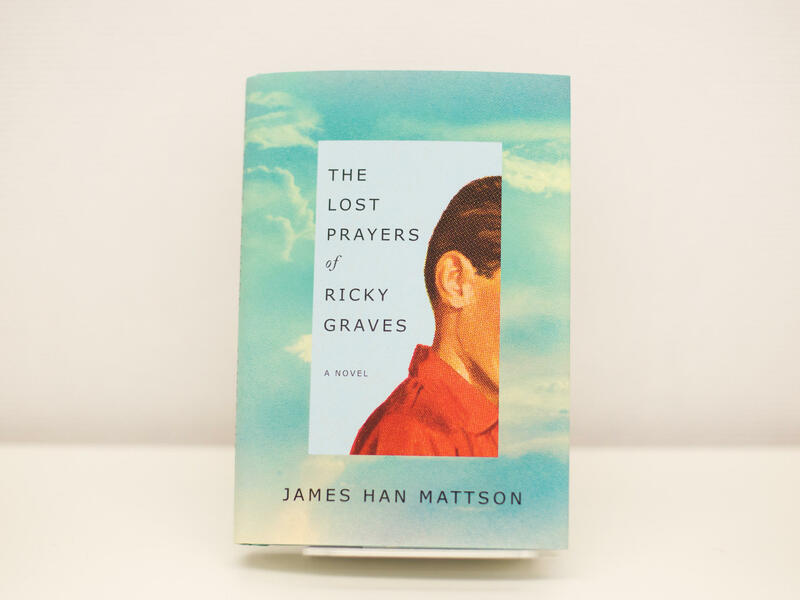 SIMON: James Han Mattson - his first novel "The Lost Prayers of Ricky Graves." MATTSON: Thank you so much for having me. Transcript provided by NPR, Copyright NPR.